Choosing your wedding cake. 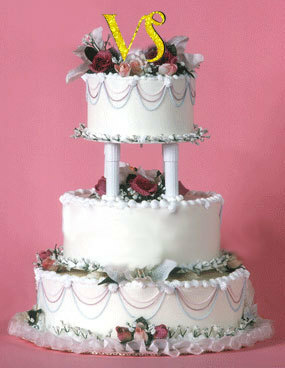 Wedding cakes for your zodiacal sign. Seasonal wedding cakes. Depending on which hemosphere of the world in which one resides the yearly divisiions vary, but for our purposes we will speak in terms of the four seasons and their zodical associations for the Northern Hemosphere. SPRING: Begins with the Vernal Equinox at the first point of Aries. As we enter the first sign of spring the key is freshness. This is the time of year when winter’s long endurance gives way joyfully to newness. This is the real start of the New Year when we look at the zodiac from the astrologer’s perspective. Youth and the boundless energy that brings the budding of flowers are on display. There is a sense of a new beginning and hope in the air. Spirits are up and enthusiasm for starting on an innovative road of life is the theme. The Wedding cake suggestion for an Aries wedding is a dark pink strawberry flavored butter cream cake with strawberry, kiwi and kirsch liquor filling in-between the layers and finally enrobed in tons of rich, smooth fudge icing. Still want to kick it up a notch? Why not go for super hot? Enhance the punch add chopped Habanero Peppers to the fudge icing. This is springtime in its fullness when all of the bulbs have opened and the possibilities suggested during the beginning of the season with Aries have materialized. Gone is the hopeful aspect of the season, replaced by the complete “having” of this time of year in all of its beauty and bursting blooms. All is full, almost bloated with life energy and plump servings of what Aries only hinted. “Having” and ownership are the heavier themes now. The wedding cake suggested for a Taurus wedding is rich, butter cream chocolate cake laced amply in-between the layers with pistachio-mint cream filling with rich cappuccino fudge as the first layer of icing all enrobed with slick almond marzipan as the outer coating and decorated with metallic icing scroll work. An edible 28 karat gold lock and key would be an understandable toper on this cake. This is the last third of the spring season when that period is winding down, thus the natural changeability we find in all mutable signs (marking the end of each season) such as Gemini. Flowers which were so perfect earlier with the Taurus wedding can fade and possibly replacements decided upon at the last moment due to new weather conditions etc. As the heat of summer wafts its heavier self upon some of these last days of spring, adjustments like tents to shield the festivities from higher temperatures and cakes frosted without butter cream icing are usually made. This is a time of adjustment of season and like wise of plans. Wedding cake suggested for the Gemini wedding is rich lemon citrus cream cake flavored with Crema de Lima (a citrus fruit liqueur from Spain). Almond apricot cream filling for between the layers and a first thin layer of mint frosting enrobed in slick almond marzipan decorated with sugared sliced lemons, limes and candied violets with tons of candied mint leaves. Additional scrolls of clear spun sugar would move this cake into the trendy fun the Gemini so loves. SUMMER: Begins with the Summer Solstice at the first point of Cancer. Summer is the time of the year associated with a laid back lifestyle and an at home wedding personifies this theme. Again, as with the Aries wedding starting the springtime, we are experiencing the first start of the summer season. Here we want to set a more relaxed mood as compared to the strident energy of spring. Time honored traditions like dacories under the elms, strawberries, sunbonnets and floral embellished fly swatters (Grandma Peabody had them at her summer wedding) near the tables are all part of setting what is family. Little touches which might be considered all too passé are in with a Cancer wedding. Dishes prepared lovingly by friends and neighbors work here. When it is all about tenderness and true love and family the Cancer time is for you! The Cancer wedding cake is simpler than most, but certainly no less tasty. Lovely rich white cake with a light pink peppermint cream filling flavored with Peppermint Schnapps with a few strawberries between the layers. Very pale lime green marzipan slickly coats the cake decorated simply with fresh flowers and silver dots of metallic icing. This is midsummer and the season is in full swing. All that is summer is here, the heat, the ripeness and the drama. The flowers that last in the heat are all in bloom, night weddings and light packages are on. Cameras are filming. Elaborate and impressive are key. There is nothing too grand or dramatic to be overlooked. This is summer! This is the time of strong statements artfully made. Couture garments and morning coats rule. If one is asked to participate in this event it is to be understood that you have been privileged to serve. The Leo wedding cake must be dramatically tall! How many layers may not reflect the number of the guests to be served, of course, as its all about the look. An orange flavored yellow cream cake laced between the layers with mocha cream flavored with Kahlua (mocha liqueur) and raspberry filling. A thin first layer of apricot icing enrobed in a final layer of slick almond marzipan decorated with white chocolate roses and gold metallic icing swirls completes the display. Now, although we have a seasonal change occurring as we did with the mutable sign of Gemini, we do not see the last minute rush that occurred. Here the possibilities for this change have all been estimated and the proper plan Bs are all in place. Above all the endless attention to detail does not impress the guests as taking place and all proceeds as if by magic. Again, this is seamless perfection! There are no sagging cakes because of weather, there are places for the wheelchair bound to “park” at table, thank you notes simply need to be personalized from prewritten templates which have been so cunningly executed that their format will never be noticed etc. The Virgo wedding cake is rich vanilla cream cake filled in-between the layers with chocolate cream flavored with Cherry Heering (cherry liqueur) and real cherries. A thin first icing flavored just slightly with lemon and then all enrobed in slick almond marzipan decorated with sugar flowers and precise dots echoing the many covered buttons to be found on the garments of the bridal party completes the precision. FALL: Begins with the Autumnal Equinox at the very first degree of Libra. This is the start of the fall season and again one needs to work to set the mood of fall and differentiate from the last of summer. The weather will help you to do this in most sections of the country and you will most likely have to turn to imported and forced flowers. Music is far more important at a Libran wedding than most others. It is highly important that it be harmonious and refined music. Simple harp music and violins are perfect for setting the mood early on at the reception. Later things can move more up tempo. Also, the first dance with the couple alone is key as Libra is all about the two of you and spotlighting you both brings that theme alive. The Libra wedding cake is a pale, pale blue rich Pina Colada flavored cream cake with cherry filling flavored with Cherry Heering (cherry liqueur) in-between the layers. First a thin layer of very delicately flavored pineapple cream icing which is then enrobed in slick marzipan outer finish lavishly decorated with tons of butter cream roses, scroll work and silver metallic edible beads. As the second water sign of the zodiac and the representative of fall in its full sense, the airy lightness of Libra is gone, replaced by a sensuous emotional water essence. The days are shorter now and the entire event should be shorter in tune with the day length. . The Scorpio wedding cake is red velvet cake with chocolate flavored with Drambuie (Scotch malt whisky and heather honey) and chopped walnuts in-between the layers. A first thin coating of vanilla icing next all enrobed in chocolate ganache. This masterpiece is decorated with chocolate cupids, flowers and highlighted in edible 24 karat gold leaf. As sagittarius is the third Fire sign and fixed there is unimpeachable sentiment and exuberance so associated with the ruling planet Jupiter. Here is the true winter wedding and all of the warmth associated with the season can be yours to enjoy on your special day. As long as you keep your bridal party from resembling wrapped packages it is hard to go wrong with this theme. The Sagittarius wedding cake is large. This could mean wide instead of simply tall. The cake is yellow rich butter cream injected with eggnog-nutmeg cream filling flavored with Black Duck Cranberry Liqueur (Paramount Distillers Inc. Cleveland, Ohio). In between the layers there is orange, lemon, cinnamon, cream filling with cranberries. The first thin coating of icing is lemon flavored and then all is enrobed in rich white chocolate ganache and decorated with scroll work, sugared berries and mint leaves. WINTER: Begins with the Winter Solstice at the first point of Capricorn. This is midwinter and it needs to be kicked up a bit to be attractive. If the couple is to honeymoon on sunny tropical shores at a posh resort and this information circulates at the celebration, so much the better. Everything that can be done to heighten the day should be done. The Capricorn wedding cake is a classic white cream cake filed in-between the layers with ambrosia cream filling. The first thin layer of icing is flavored with crème de cassis (a French liqueur made from black currants). Finally, all is enrobed with slick marzipan totally covered in icing roses and tiny bunches of deep blue currents made out of molding chocolate. The tall cake includes a sugar temple in the round surrounding classic couple dolls set on the topmost pinnacle of the cake. Optional are the wafts of spun sugar which might lie around the “seams” of the top three layers indicating the loftiness of the structure. Aquarius, the third air sign which is fixed in nature. This time of year is also the “dead of winter”. Perhaps that is why it needs a little oomph of some kind or another. The key here is unique application of the couple. The Aquarius wedding cake is pale, pale green butter cake with chopped pistachios in it. In-between the layers is cherry, rum, milk chocolate filling. The butter cream icing is flavored with coconut and Cherry Heering (cherry liqueur). White chocolate cherubs, metallic silver scroll work and sugar red cherries decorate the cake. Pisces is pure in intent and cares deeply, so this kind of simple emotion should be reflected in the character of the ceremony. Single flowers such as lilies and romantic up-dos for the hair are appropriate. Colors should be pale and delicate. We are still technically in winter, although this is when winter hints at the long awaited exuberance of spring, but it is pensive. The Pisces wedding cake is lemon-lavender cream cake filled in-between the layers with Cointreau (orange flavored liqueur) flavored chocolate ganache. The whole cake is iced in rich butter cream vanilla icing and decorated with garlands of sugar roses “anchored” with clusters of sugared violets.